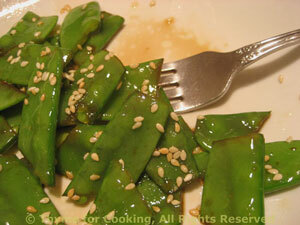 Sautéed Mangetout (Snow peas) with Sesame Seeds, Thyme for Cooking sides. Another of those fleeting spring vegetables. They cook quickly and are more versatile than 'just for stir-fries'. If they are small, leave them whole. If they are large (2", 5cm) cut in half or thirds, at an angle. Trim pea pods by snipping off the stem end. Add pea pods and soy sauce and sauté 3 - 5 minutes, depending on size, stirring frequently. Taste, when they are done to your liking, remove, sprinkle with sesame seeds, soy sauce and serve. Toss or stir them about in the pan until lightly golden, about 5 minutes.